Topher Mallory is “from away,” but worked his way up to Maine in his own time. A Massachusetts native, he competed his undergraduate degree at the University of New Hampshire, studying Business/Finance and Art. He had spent time in Maine’s mid-coast during the summers growing up and fell in love with it. During those summers he took up a job with Mexicali Blues and as the shop’s owner Pete Erskine says it, “[they] pulled Topher into its orbit slowly, but inevitably.” He is now the CEO of Mexicali Blues and recently started another, more personal endeavor: Split Rock Distilling. 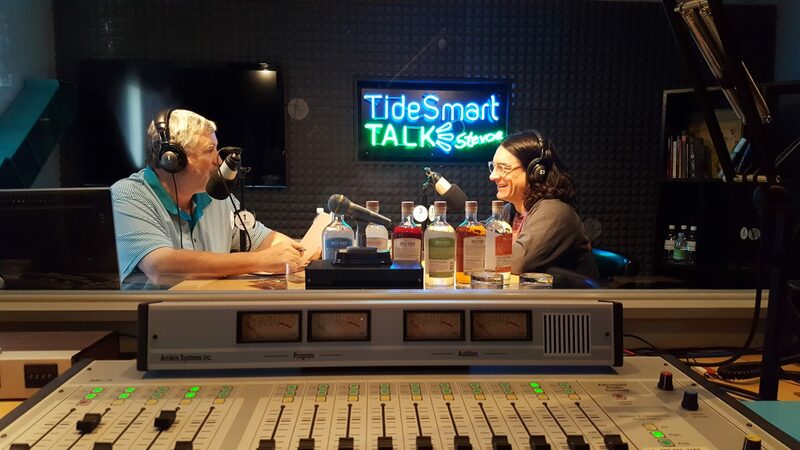 Host of TideSmart Talk with Stevoe, Steve Woods, welcomed Topher Mallory(at right). Mallory joined us recently with product in tow. Split Rock Distilling, an organic distillery, is currently producing vodkas, whiskey, and bourbon. They’ve only been distributing for a short while, but Mallory says he and business partner Matt Page are already looking to expand their line to include gin and rum. They’re also hoping to hire some employees within the next year. They’re pouring daily at their location on Route One in Newcastle and selling locally at RSVP on Forest Avenue in Portland and at the Bow Street Market in Freeport. To find it at your local store or bar, just talk to your bartender or ask for it to be stocked. In Mallory’s “other” world, Mexicali Blues is currently selling over 40,000 products that are sourced from artisans worldwide. Owners Pete and Kim Erskine are the purchasers and travel all over to find the right products for their stores. Mallory, the financial expert, is overseeing the chains six locations (Bangor, Portland x2, Freeport, Raymond, and Newcastle). Last year, the store gave over 1% of their profits to earthquake relief in Nepal where some of their vendors live. Going forward they would like to continue the trend of giving back for as long as they can. The stores have also been hosting “retail-tainment” events. In July the Freeport location hosted an event where the owner’s son, Caleb Erskine, owner of Living Intent Yurt Company, set up a yurt for a free yoga class, henna tattooing, and educational classes during operating hours. They are planning on continuing these events at their other locations throughout the summer. For more information on Mexicali Blues, Split Rock Distilling, or Topher himself, please listen to the interview below. You can visit the store’s website at MexicaliBlues.com, on Facebook at facebook.com/MexicaliBlues, or on Twitter @Mexicali_Blues. Split Rock Distilling can be found at SplitRockDistilling.com, facebook.com/SplitRockDistilling, and on Twitter @SplitRockMaine. You can also follow Topher on Twitter @ToperMallory. Posted on Monday, July 25th, 2016 and filed under Show Recaps.